“Fortress Scotland” is conceived as a site by site examination of the fortified places of Scotland, and is made up of a series of volumes with a geographical focus. This second volume covers all the lands watered by the entirety of the Spey river system upstream of the Rothes area, stretching inland to the border of Lochaber, including a total of 85 sites within the main “gazetteer” section. Included within this list are castles, fortified houses, hill forts and earthworks. The entry for each site is accompanied by colour photographs, mostly taken by the author. The entry contains a description of the remains today, along with details of the development of the site throughout its occupation, and a history of events that took place at and around the site. As part of the concept, the stories are told of the families and individuals who owned and lived at the site. The rise and fall of the Comyns, Leslies, Grants, Shaws, Macphersons, Macktintoshes, Gordons, Douglases and of course the royal Stewarts is told through these stories. 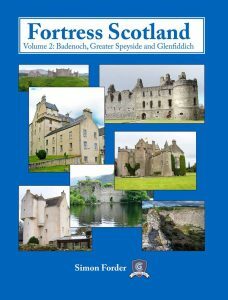 This first volume includes well-known and popular tourist destinations like Balvenie Castle, Ballindalloch Castle and Ruthven Barracks, lower profile sites like Lochindorb and Drumin, sites which are almost unknown like Mullochard and Keithmore, as well as occupied private residences like Castle Grant, Dunachton Lodge, and Cluny Castle. Historically, the area covered by this second volume is very rich, but also largely unknown. It was an important route between the royal heartlands of Scotland and the fertile and wealthy northern half of the kingdom, and thus of vital strategic importance during the process in which the Kingdom of Scotland came into being, and again during the Wars of Independence. Dominated by a small number of powerful magnates, and later by the complex network of allied and feuding families, it was to fall into insignificance after the 16th century save as a source of manpower. If you would like to purchase a copy of Fortress Scotland Volume 2 then please contact me by email and I will advise the current situation.